These patterns are for personal use only, all other rights are reserved. To put it another way, the article posted here is the distillation of thirty years worth of research and experience. By putting it on the Web, I am giving it to you for free. But that doesn't mean it has no value to me! What I ask of you in return is credit for my thirty years work. No part of this article may be reproduced without permission. The patterns may not be reproduced for sale under any circumstances. 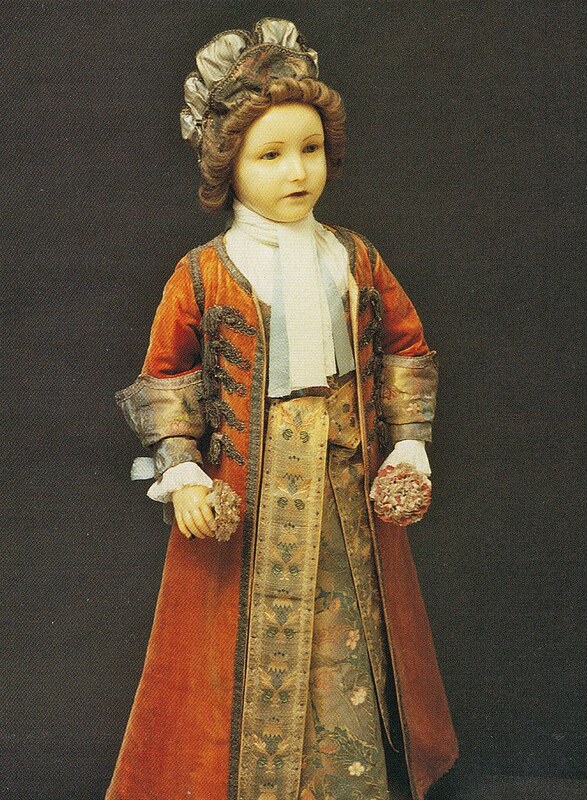 You may use this information and these patterns in replicating 18th c. toddler boy clothes for your own use or as gifts, but not for commercial resale. In any use of this article or of any of the information contained in it, this author and this article must be properly cited, every single time, as the source of your information. So your reenacting baby is starting to learn to walk. 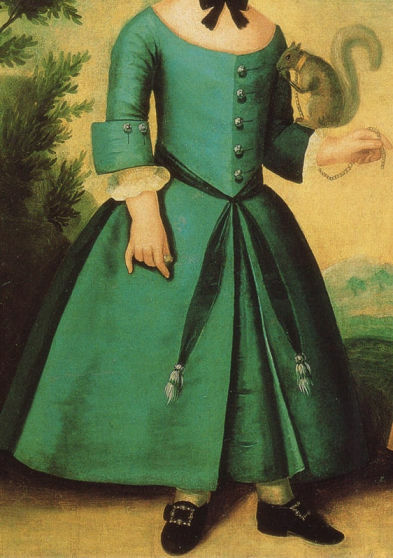 It's time for him or her to graduate out of infant-styles of eighteenth century clothing, with the long robe and petticoat that extend well past the feet. It's time for him or her to be "short coated" and begin to wear toddler styles. Here is where boy clothes and girl clothes start to differentiate. Yes, there are differences, even though both genders are still in petticoats. What's more, there are multiple styles to choose from. A girl toddler would begin at this point to wear a shift, petticoat, and cap, with a back fastening gown that has a fitted bodice and a full, pleated skirt. This style of gown requires an actual pattern, and there are several on the market; if you need to dress a toddler girl, I encourage you to seek out and buy one. 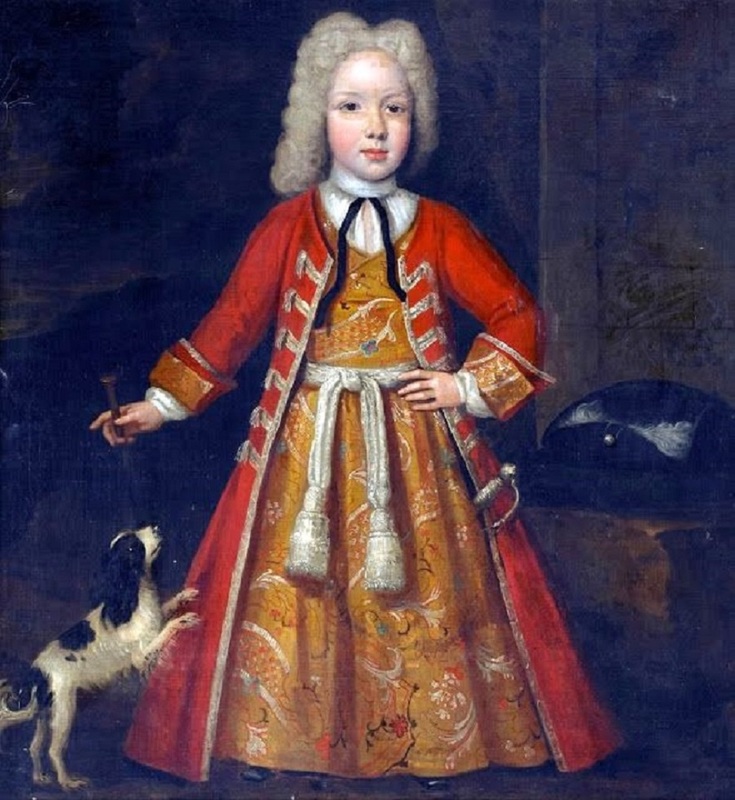 But at present there are no patterns available which are suitable for eighteenth century clothes for a toddler boy, a child between the ages of 1 and 4. A boy in this age bracket could wear one of several styles. All are front fastening, and would have been worn with shift and petticoat (or possibly a back-fastening underdress). Some more closely resemble a man's coat, only long skirted, with set in sleeves that have cuffs. 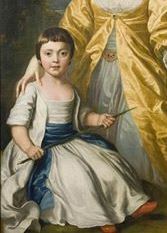 detail of portrait by Joseph Badger, Boston, Mass. And some of these even have false waistcoat fronts to complete the look. A subset of these mannish ones have a low cut neck. 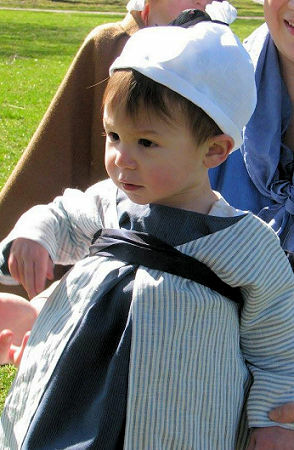 The toddler boy coats in these styles tend to follow the men's fashions of their day, which evolved through the century. However little boys also wore a less formal style, more like a man's banyan. In this article you will find a pattern for the easiest-to-make style I can document for a boy toddler's gown, which is the banyan-type robe. You will notice that it bears a strong resemblance to the infant robe in the Baby Layette directions elsewhere on this website. It also bears a strong resemblance to certain styles of adult women's bedgowns and adult men's banyans. It is the easiest-to-make choice for a toddler boy that will still give him a historically accurate appearance. 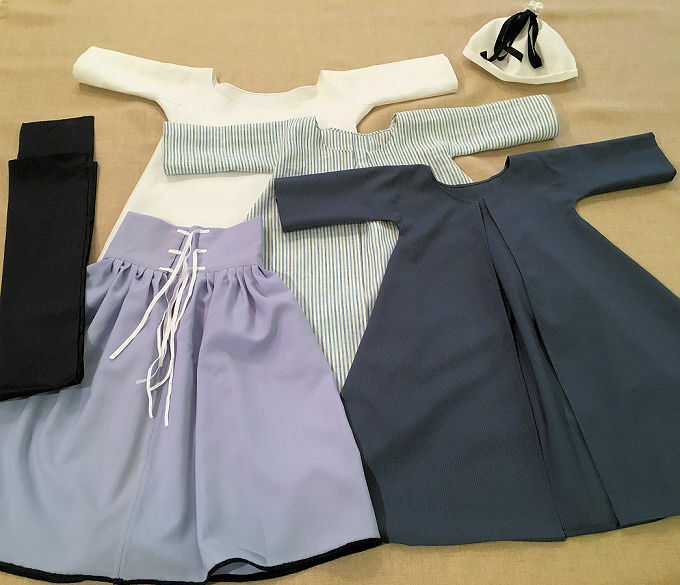 Also included here are patterns for the necessary underwear, a toddler sized shift and petticoat. These are suited to both boys and girls. Toddler boys often are depicted bareheaded; boys seem to be the group for which, in the 18th century, bare headedness was most acceptable. But they also could wear a sized-down version of male headgear. I have included directions for one style of casual men's cap, resized for a child's head. Once you have these items, a pudding cap and leading strings might be useful additions. 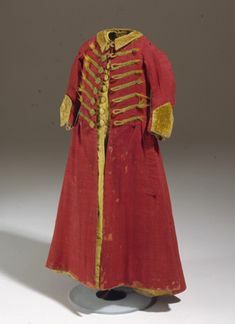 Also, there are those other forms of toddler-boy robes which are more structured and complicated, resembling more or less a long-skirted man's coat in miniature. What I offer here is just one option, the bare minimum, so you can get your walking baby boy clothed and kitted as efficiently as possible while not cutting any incorrect corners. A word about sizes-these patterns were developed with reference to a modern chart of standard measurements for the average modern child, and are intended to fit the average 12 to 36 month old. However, realistically, all toddlers are not the same size or shape. Please use these diagrams as a guideline. If you know your child to be unusually tall, short, or chunky, please make the appropriate modifications. Make a mockup if you need to. These patterns are not guaranteed to fit all toddlers perfectly without adjustments. 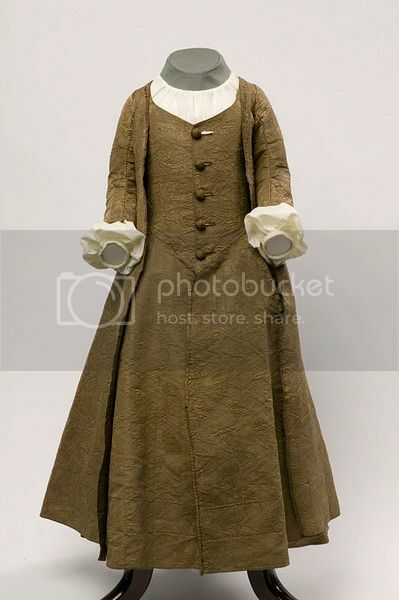 The patterns in this article were beta-tested by Ruth Hodges, who made up a complete set (shift, petticoat, two gowns, sash, and a hat), as loaner clothing for her reenactment unit, the Lincoln Minute Men. All photos of Ruth's garments were taken by Ruth and are used with her gracious permission. A Note on the Pattern Diagrams: In every cutting diagram given, each square of the grid equals one inch.